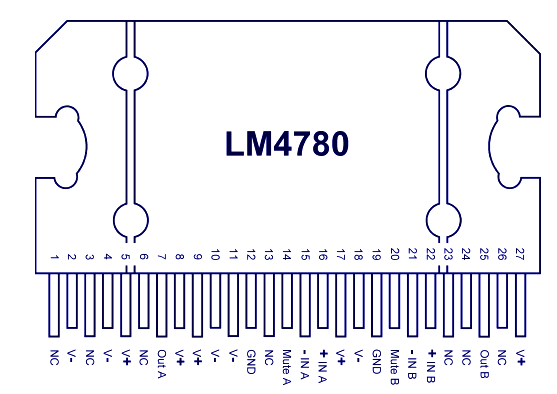 The circuit diagram shown here is of a 2 x 60 Watt stereo amplifier based on the LM4780 from National Semiconductors. LM4780 is a superb audio amplifier IC capable of delivering 60W Rms power output / channel into 8 ohm speakers. The LM4780 has very low total harmonic distortion (less than 0.5% at full output) and has a power supply rejection ration (PSRR) of 85 dB. The IC requires very few external components and has a built in mute facility. The LM4780 is completely protected using their trademark SPiKe technology and has a signal to noise ratio greater than 97dB. The circuit given here is well suitable for applications like components stereos, self powered speakers, home theatre systems, compact stereos etc. The circuit must be assembled on a good quality PCB. The amplifier can be powered using a 35V DC dual supply. K1 and K2 must be 8 ohm, 60W speakers. An adequately sized heat sink must be fitted to the IC. Noninverting inputs are not polarized. The bottom amplifier has inverted inputs. The schema is not working. Can you make full instructions and send to me i’m confused on the pins for the lm4780, switch with the 10 ohm resistor and the inputs A and B. How could i use a pententiometer to make a volume switch and could i use an audio jack female for the inputs? Sir, can we use laptop stereo output for this amplifier circuit with out using preamplifier circuit…? i like to assemble this 60 watts IC audio amplifier. will you please send me the schematic and block diagram. i appreciate so much if you can. thank you. will you please post the ckt diagram with the IC leg numbers. i have a doubt that t/f 0v should connect to the ground of amplifier circuit or no connection?im using 24-0-24 2amp t/f.i want to know the heat sink size of LM3886. Hi Prakash connect 0 of trafo to common (shown as ground)of the amplifier. The heat sink should be a minimum 2mm thick 20cms by 10cms aluminum. for this size if you use an extruded alloy heat sink with fins will be the best. hi, I have a SONODYNE MODEL NO SC-3070 amplifier.but have not speaker.please send it to me how many watt @ohms speaker. Sir i have 1 question…can i use a TDA7377 instant the lm4780? Is the output of this amplifier full range? also would it be possible to separate the output into a Low/Mid and High? Hi Devendra try TDA2050 will give you 50watts power with very low distortion. you can use two as push pull amplifier similar to TDA2030 but with lesser distortion figures. Sir, lm4780 op-amp is not available in allahabad. 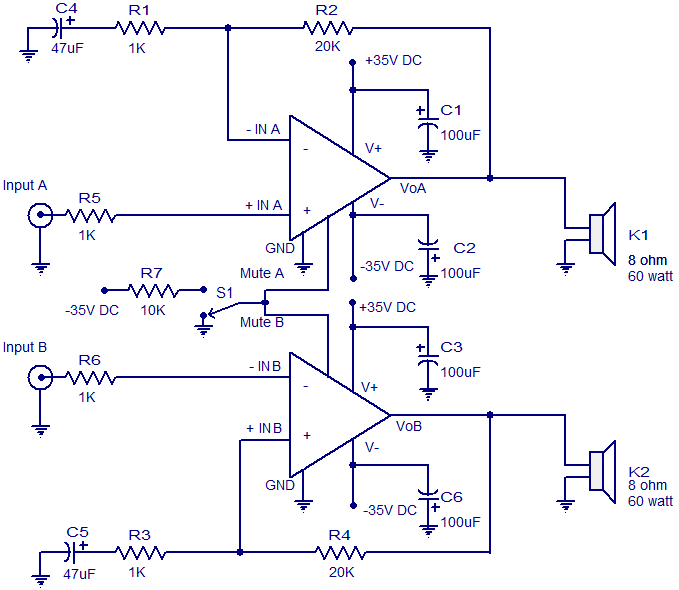 Can you tell me some simmilar i.c.s for stereo amplifier. Hi Shubham our passive tone control unit has got all required controls for a stereo system (one for each channel that is two of each controls). kindly go through the article. Sir, as you said to place volume and tone controle before inputs a & b using preamplifier,but as this is stereo amplifier hence two preamplifiers must be used and this will cause pair of volume and tones control 1 for each channel. Which is not practical. Tell me sir what to do. Probabily i didn’t understand what u said in previous post. Hi Shubham LM4780 is a dual channel high power operational amplifier (with inverting and non inverting inputs similar to an operational amplifier). Input A & B should be connected through volume control. A pre-amplifier has to be used before this mail amplifier. Use the passive tone control appeared earlier which has got volume, bass treble controls. What is name of operational amplifier used, and what is lm4780. Please explain i am confused. I want to know that where i can place volume controle for speaker? Hi Rohit This willbe suited for simple stereo system with only two front full range speakers of 60 watts capacity. for side and rear speakers you require amplifiers around 10watts capacity each. Can we add more speakers such as front (left & right) rear (left and right) speakers to this circuit. the PCB art work for dual side PCB is available on National Site. artwork to given to PCB manufacturer for requirement. not readily available in the market. visit following site. wher can i find pcb of this? Hi Pattrick you can use 10K potentiometer as volume conrol just before the input to IC pin no 16 and 21 of the IC input A & B.
you can also refer to National semiconductor application data. Can you introduce a potentiometer as volume control for the above circuit. what is the budgetary cost of this project, excluding the power supply. you suggest me 27 â€“ 0 â€“ 27 transformer @ 2.25Amps for 2 x 60watts but will it required more current on bridged configuration or the transformer ratings will remain same? can we get 120 watts mono from lm4780????????? Hi David I am yet to try, ordered and waitng for the chip at chennai. I love STK465 that is discontinued but a great chip by sanyo, kicking for the last 17years at home. it is working or not ? IC pin configuration Name and Diagram Pin Name r No match? plz Chk VoA or VoB is Speaker out and Hi Name Is not for IC? Hi, when u try this diagram? Hi Adnan I am yet to try. You require a 27 – 0 – 27 transformer @ 2.25Amps rating for stereo amp. is the 32-0-32 volts 4 amp transformer is suitable for this?????? if not then suggest the power supply??? do you checked this amplifier in Ur lab??? ?